Fully ordained in 2013, Mark Steuver is the first North American born disciple to become a Shaolin Monk In the temple’s 1500-year history. He is a 34 generation Shaolin Warrior Monk, the direct disciple of the venerable Abbott Shi YongXin. Mark Steuver now goes by his Buddhist name Shi Yanjian. Beginning Chinese martial arts training in 1979 Master Yanjian has over 37 years of training. Adhering to the discipline and principles that martial arts was founded, he can perform at the highest-level during competition. 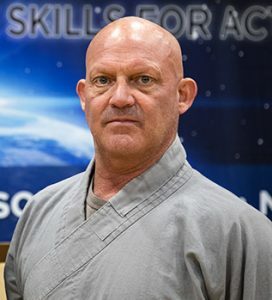 Some competitive awards he has received include, multiple medals from competitions in Mainland China, multiple police Olympic medals, the Arizona state kickboxing title, and 13 Grand championships in open tournament competition in the United States. Master Yanjian has also studied the history and culture of martial arts which led him to the birth place of martial arts, the “Shaolin temple”. His first Shaolin Temple trip was in 2001 and he has returned 13 times, now he has accumulating over four years of living, training and competing in China. Shi Yanjian now speaks fluent Mandarin Chinese studying in both Chinese and American Colleges. Choosing a life that involves public service Shi Yanjian has worked for the Eloy Police department as a Police Officer, at the Casa Grande Elementary School district special education department as a Crisis Prevention Instructor and has been instructing martial arts for the Central Arizona College since 1999. Instructor Supervisor and trainer, Master Yanjian has been with ACTIVSTARS since 1999 and has the highest belt ranking obtainable. He has also received honors such as “Instructor Extraordinaire” and “Above and Beyond” plaques. Adults, Children, Athletes and Persons with special needs and are welcome to Master Yanjian”s classes.